UK based sack manufacturer Sackmaker / J&HM Dickson Ltd has launched its brand new Securesack™ range of Kerbside Collection Sacks which it anticipates will bring significant benefits to Councils and waste management companies across the UK. The revolutionary Patent Pending design does away with flap type lids, incorporating a fully closing cover into the sack which keeps recyclate securely inside even if it’s knocked over. It also provides protection from wind, rain, snow, seagulls & foxes. The sacks stand upright for easy filling and feature a fast open & tip design to assist recycling crews. 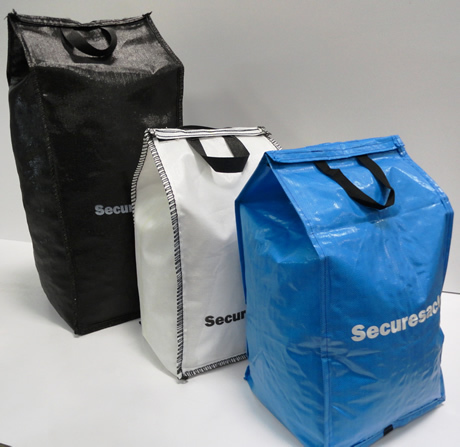 Sackmaker offer a Securesack™ version of all their reuseable Kerbside Sacks, Garden Waste Bags & Gull proof sacks. The ISO 9001 / 14001 accredited company supply over 200 UK councils with kerbside sacks, Boxhat® covers for kerbside boxes & offer a bespoke sack manufacturing service for special requirements. Established in 1915 they are the oldest manufacturer of Woven PP sacks & bulk bags in the UK – pioneering the first kerbside bags 25 years ago.